Tiny Beowulf agonized for a couple of weeks that he wasn’t going to have a costume — a laughable thought, at best. He already has a trunk full of them to play dress-up in. But what if he couldn’t figure out something new for this year? “But what if you can’t?” he wailed. He looked skeptical but calmed down. “But what if you can’t?” he persisted, stubbornly clinging to his doom. Tiny Beowulf is kind of a nihilist sometimes. “I know what I want to be,” my daughter said, in a slightly Hermione Granger kind of way. (Like she does.) “A black cat!” She has been focused on this costume idea since the start of the season. An eyeball. Because, you know, natch. 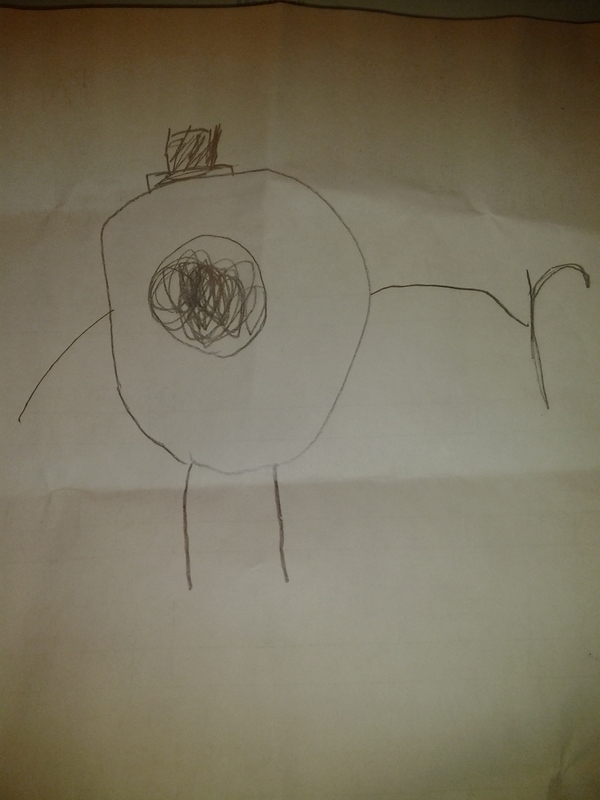 I wonder if we can find a way to make the eyeball googly? As the seasons change, I rotate my wardrobe out so that spring/summer clothes and fall/winter clothes each get their own place of pride for about half the year. It’s practical and saves me time when I’m trying to figure out what to wear, and it protects the garments when they’re out of season. It also feels slightly like getting lots of new clothes twice a year because I haven’t been looking at the same old things every day. The real thing, though, is that I have too much clothing and can’t fit it all in my closet. I love clothing as a means of personal expression. I use it as shorthand. I use it as armor. I use it as a way to remind myself, daily, of who and what I am. You might say my interest in fashion is really my only hobby, but I remember the expression “Clothes make the man.” (Or in my case, the woman.) After Tiny Beowulf was born, my image was wrecked. My body image, my self-image, the way people saw me, all of it. I had a lot of grief from his birth and from his first week that I carried around for a couple of years, and until I could let go of it, I didn’t have enough emotional wherewithal to care for myself — doing the “little” things which actually make up our self-concept — after caring for my family. Eventually, I got better. And a big part of that healing’s manifestation was my image, what people saw when they looked at me. (Yes, part of the problem came down to my appearance, galling as that idea might be.) I learned that the image I put forth matters not only in how people perceive me, but also in how I perceive myself. I mean, other people have to see me during the work day, but I have to see myself in the mirror and like it, and my family has to look at me, too, and know that I haven’t given up. I cannot be a drudge, and at that time in my life, I really kind of felt like one. So I snapped to. I recognized I was a respected professional with a good life, and I needed to look like it. I made my appearance reflect what I wanted people to see of me. The difference was extraordinary, especially in my career. (Hello, three big new committee assignments within six months.) And in my personal life, I no longer felt the slow creep upward of my age and the decline of my happiness, or measured my worth in the measurement of my waistline. So yes, I love clothes. But I have too many. When I was rotating my wardrobe last week, I cleaned the closet out for good measure. I reduced the skirt population by eleven, excised a dress, and liberated a scarf from the prison of the scarf box. (I had been keeping that scarf only because it was a gift from Europe from someone I care about, but not because I wore it or even really liked the fabric.) These items went into the donate/swap meet bin, and soon someone else will be able to enjoy them more than I will. I also cleaned out my costumes. It’s good to take inventory once a year, and right now, with Hallowe’en coming up and the largest Renaissance Faire in the country happening on the outskirts of town, it’s costume season. I have an extensive costume collection, cultivated over many years of acquisition — and before I had children, creating and building them — and over many years of being a bellydancer. In fact, one walk-in closet in my hallway is devoted to my costumes. There’s a lot. I must have been on a roll, because I cut my collection down in half. And now, I have a ton of costumes I want to sell, most of which have never even been worn and all of which are street-clothing-quality. It’s too bad I’ve never had good luck trying to work with ebay. Anyone have any suggestions of where else I could post them? I didn’t make most of them, so Etsy is out. If you’d like to be a guest contributor to Fashion Friday, click here to find out how. 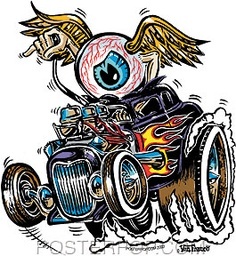 Ed ‘Big Daddy’ Roth used to have an eyeball motif in his cartoon T-shirts. Usually with wings. You could even get decals and patches. Personally, I find that used clothing doesn’t sell well anywhere. You’ll never get anything close to retail. You could try Craig’s list but then you will have random strangers at your house. Either garage sale at $1 per item or donate to a charity and get a nice tax write-off. Yes, I’ve found that, too. Sometimes it works better with the bellydance costumes because dancers are always looking for more new things, and most of these are never worn (though I know that doesn’t necessarily matter when it’s pre-owned). The costume coordinator for the drama department at school is coming to look at stuff today, and whatever’s left will probably be donated to charity. It will be a significant and useful write-off, at least!